I arrived Abuja today just in time for tomorrow's event, #StartUpFriday, if you want me you know where to catch me! LOL. StartUp Friday is an initiative of OIIE designed to promote and encourage new start-ups and foster relationships with investors, mentors and successful start-ups. StartUP Friday is a “meet-up” designed to bridge the gap that exist amongst startups, investors, mentors, buyers and other players in the Nigerian entrepreneurial ecosystem. It is to promote and foster resultant relationships that will help startups to grow and scale their businesses. 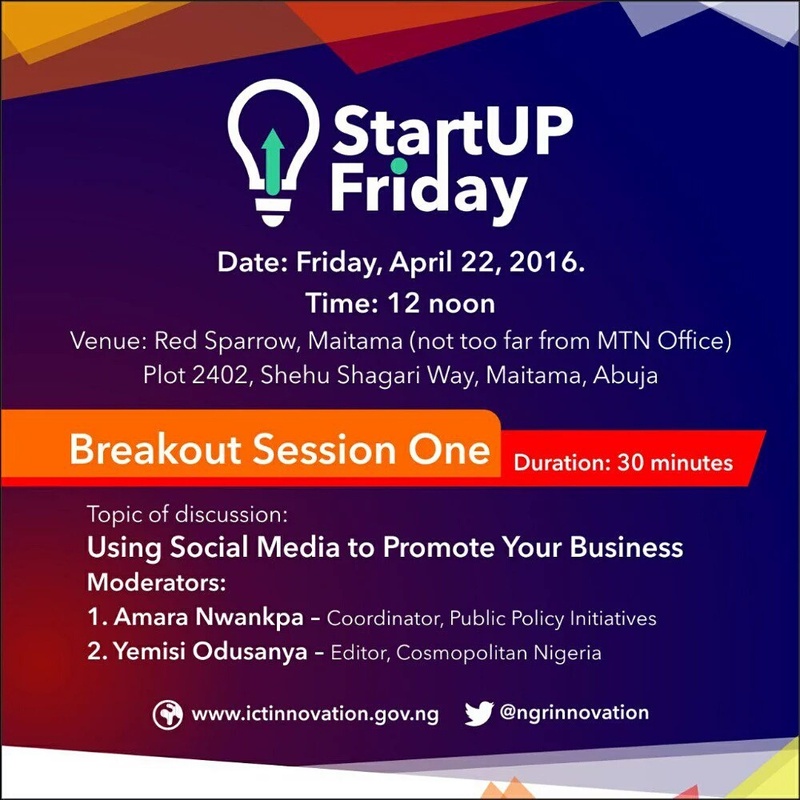 This 3rd edition of StartUP Friday will feature interactive breakout sessions and product exhibition in the early afternoon (12 noon to 3pm). While the evening session that starts at 4pm will feature Fireside Chats, “Tell Your Story” sessions by successful startups, networking, and Pitch session by 5 pre-selected startups. While the pitch session is not a competition, OIIE hopes to consider any of the 5 startups recommended by the panel of experts for seed funding. sisi God's grace all the way. one day i will be like you,getting closer each passing day believe me. I really need a workshop on how to use social media. I am so backward and lazy, I can't even navigate my way through instagram/twitter. I need to up my games honestly. Please let us know anytime u are having such program in Lagos. This is exactly what I need, but I feel like there are never workshops when i'm around. We need more Nigerian social media moguls to plan more workshops during the summer and Christmas period times when a lot of foreign based Nigerians are around. That will definitely bring out a whole lot more in these events.